A very intimate and romantic experience set in a musical atmosphere that only Italian Opera can give. Be One Of The Only Twenty Who Can Attend This Event In The Prestigious Palazzo Pamphilj At Piazza Navona. An elegant place where you can sit on your reserved seat and taste the very best of the Italian cuisineaccompanied by a selection of fine wines. The musical program with Arie and Duetti from the Opera will be held both before dinner and while the courses are being served with a final surprise at the end. The Pamphilj Palace, a baroque masterpiece, is part of a large building complex on the right side of Piazza Navona, that includes the modern day Brasilian Embassy and the S. Agnese in Agone Church. The palace was built in 1644 by the architect Borromini for the Pamphilj family, during the pontificate of pope Innocenzo X Pamphilj, who wanted his private apartment in this Palace. 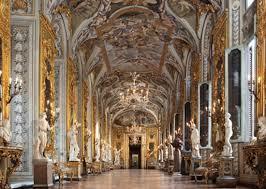 The building is an authentic wealth of art, with masterpieces of famous artists like Guercino. The Palace has a beautiful Courtyard with an old well and the belltower with the mechanism of the huge watch visible from Piazza Navona. The terrace "The Great Beauty" offers a one-of-a-kind view: you will see S. Peter’s Basilica, Castel S. Angelo, the Pantheon, the dome of S.Ivo alla Sapienza, Trinità dei Monti and Piazza del Campidoglio. A breathtaking view that will show you all the skyline of the eternal city.